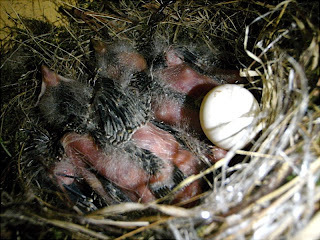 It seemed pretty clear that the smaller white eggs belonged to the caretakers of the nest, the Olive Sided Flycatchers, while the bigger brown speckled eggs were deposited by interlopers. HW and I discussed whether to intervene, but ultimately decided to let nature take its course. One side benefit of the unplanned return trip was that I witnessed the final denouement of this little drama. 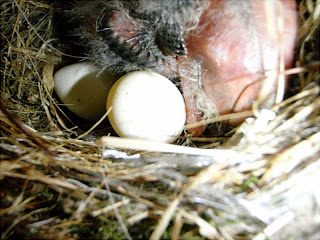 Specifically - the picture at the top of post - the last white egg - found on the porch mat under the nest. 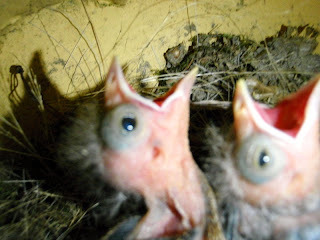 Birds are hatching, two white eggs still visible, no speckled eggs. The monsters emerge and demand to be fed. 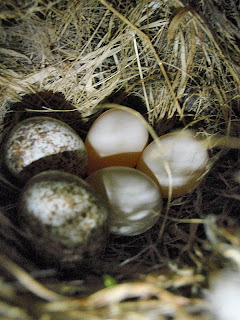 Only one white egg now visible. 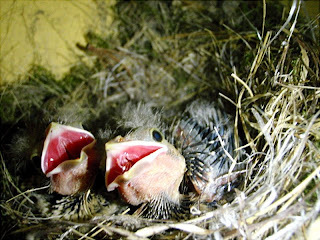 Only two birds left in the nest. 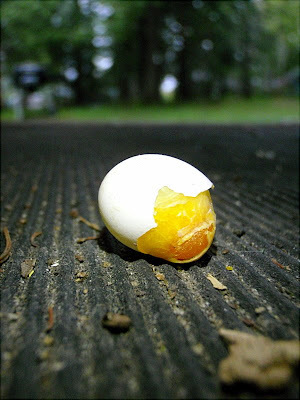 The last white egg broken on the ground. Motive. Means. Opportunity. Guilty as charged. HW guessed the identity of the perps as cowbirds. Confirmed.